Finally the semester came to an end. We had a last rehearsal at 1518 Hydrosystems outside of class, on Monday at 5 pm. The upside of coming to class for the final rehearsal was free Papa Del’s deep dish pizza. Our rehearsal went on very smoothly, except for the laptop shutting down in the middle, halting the presentation for a few minutes. Even then, we hit 60 the minutes mark, which is what was needed for the final presentation the next day. All the rehearsals helped to make the final presentation a success. We were able to connect with Mr. Peter Luswata from Uganda for part of the presentation and everyone in the team was thankful for his efforts in this collaboration. The Q&A portion of the seminar was a constructive discussion on how to improve the class for future generations and what opportunities are available to follow the evolution of this project. Everyone did a fantastic job. 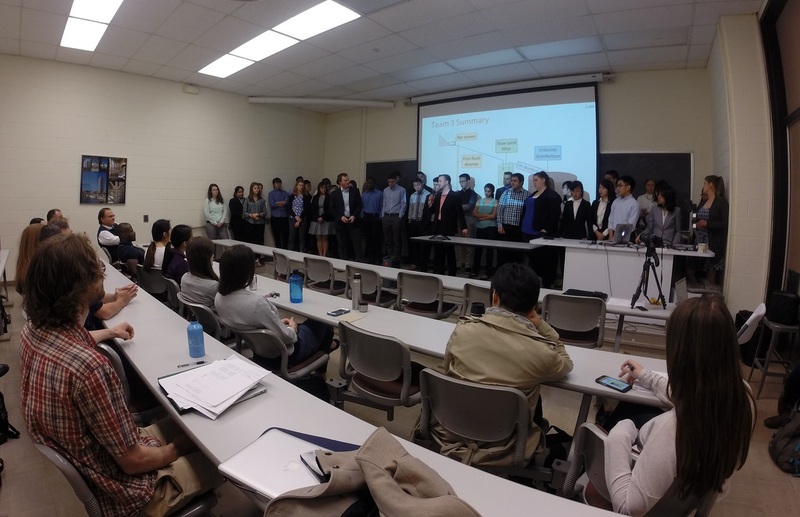 After a week of teamwork about their designs, students had their first final presentation rehearsal at the first hour of the class. 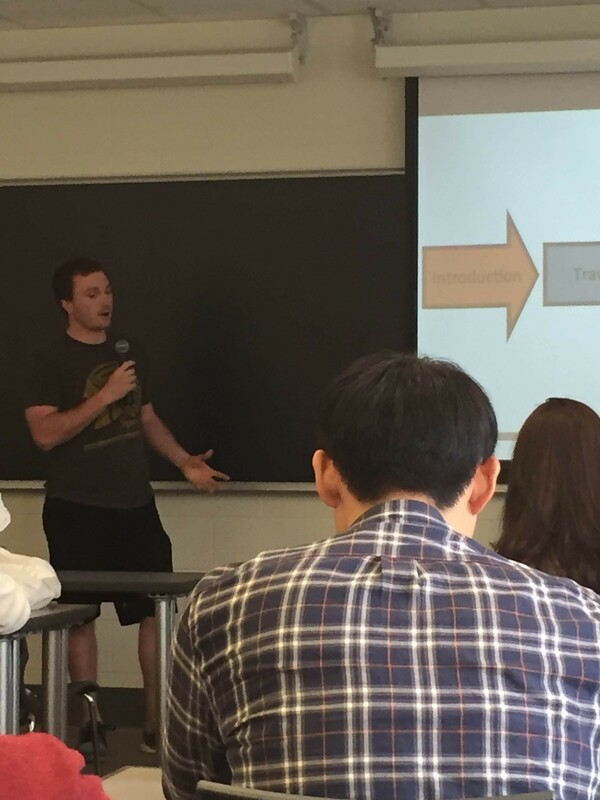 The final presentation was made up of five parts, which are introduction, travel, lab work, design, and conclusion, corresponding to previous presentations they made during the whole semester. Luke as the host started the presentation, and then everyone went up taking their own slides in order. 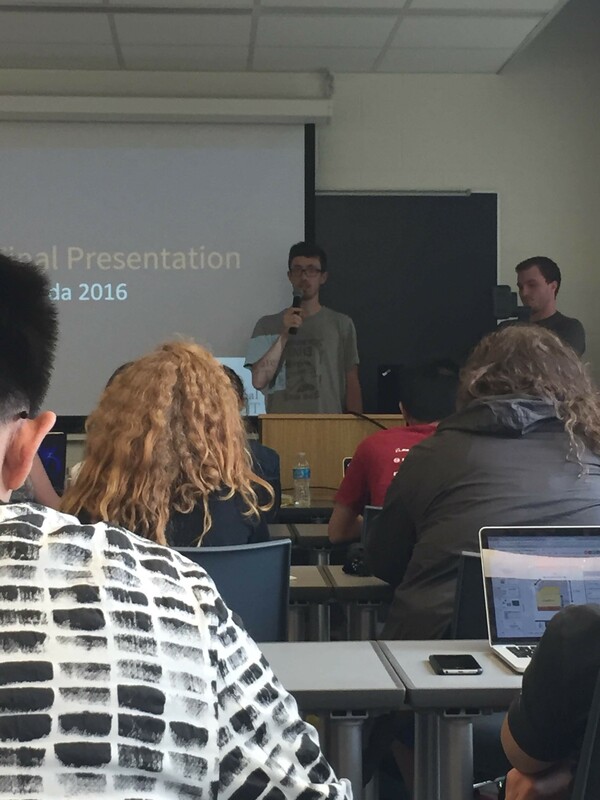 The whole presentation lasted 70 minutes, which was still longer than expected. After the presentation rehearsal, Prof. Marinas and TAs gave students a lot of comments from several aspects. Students valued these comments, and they made changes to the slides immediately after a short break. 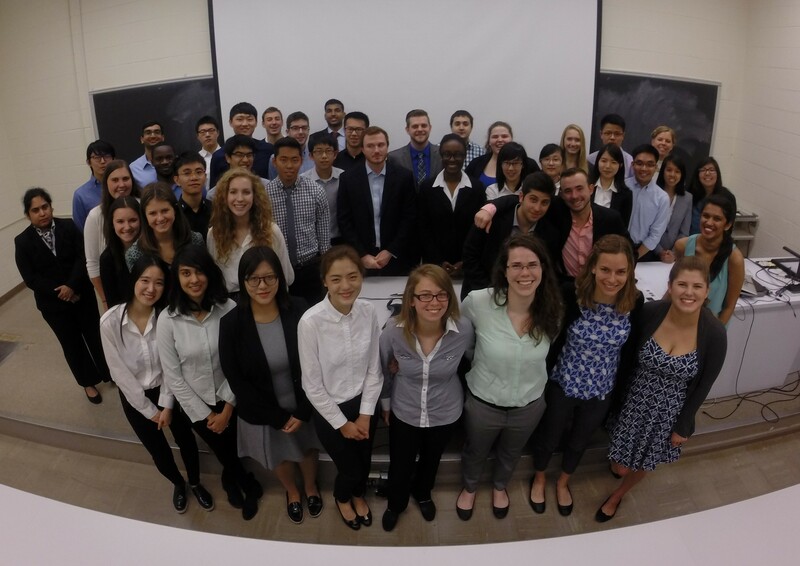 Today we had the opportunity to attend an Environmental Engineering & Science Seminar during the last hour of class. Ashraf Hameedi, a Managing Partner with Highforest Capital Ltd in London, spoke about his perspective on the need for investment in water resources. 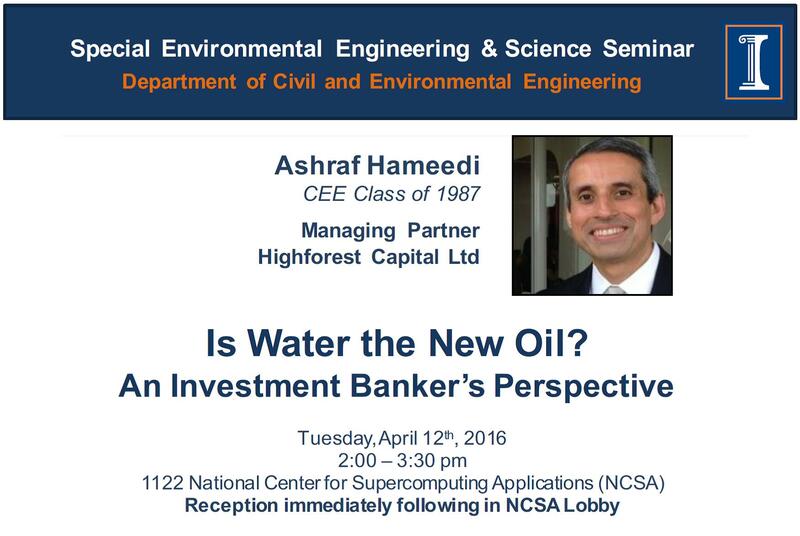 Hameedi graduated from the University of Illinois in CEE in 1987. His civil engineering background led him to pursue a career in financing and investing in large-scale engineering projects. Hameedi offered a unique perspective on water scarcity: that it may not be a bad thing. When a commodity is scarce, a demand is created. That demand means there is a market for that commodity. If water were viewed as a traded commodity, similar to oil, it might help with conservation efforts. If consumers were to pay market price for water, they would be less likely to use more than they need to. This could be made possible through the privatization of the water sector. Another key point he focused on was raising capital for large-scale water projects. This has been done extensively in the energy and telecommunications sectors and has yielded high returns for investors. By raising capital for water projects, many of the water and sanitation problems in countries with emerging markets could be solved. After analyzing the laboratory results, students were ready to begin design work for their project locations. 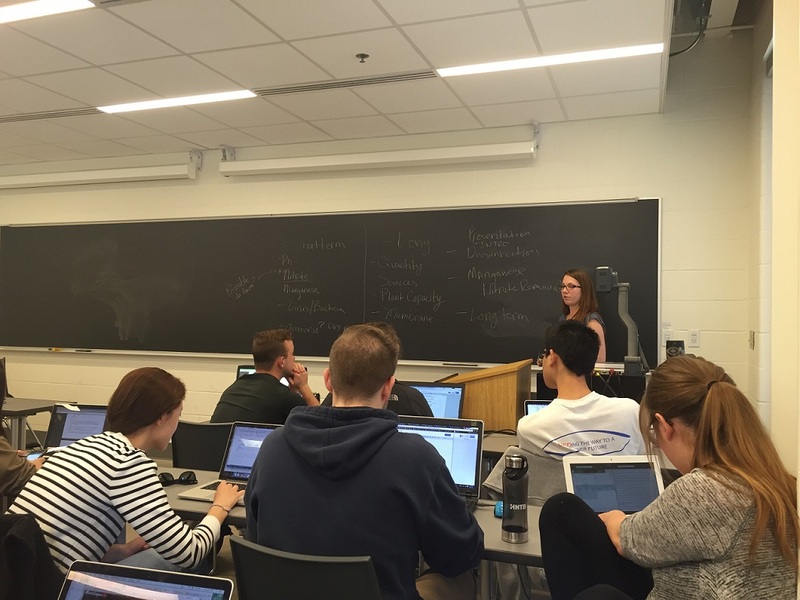 At the start of class, the students immediately broke up into their respective teams and began discussing what was necessary to tackle the challenges associated with each project site. Team 1 is working on a design at Lake Rugezi. Team 2 is working on a design for the Nyamabuye Water Treatment Plant. Team 3 is working on a design for the Muhondo School. Specifically, team 3 is looking to improve water quality, water quantity, sanitation, and energy at the Muhondo School. 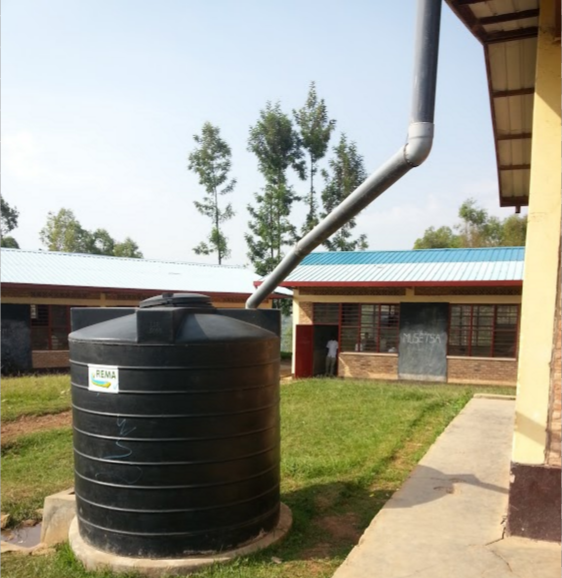 The school currently uses a rainwater catchment system to provide students water. There are two areas team 3 believes they can improve the system in place. No treatment system is in place for the rainwater collection. This leads to high amounts of turbidity, ammonia, nitrite, and pathogens in the collected water. 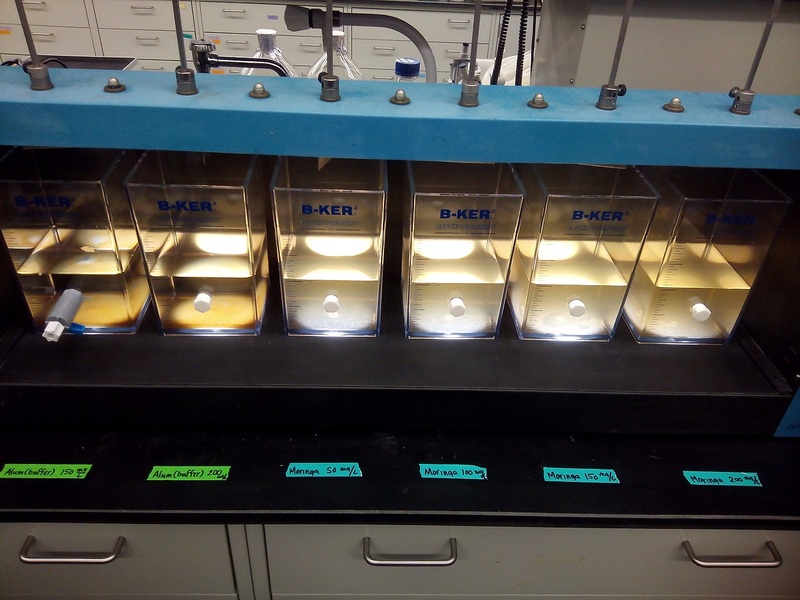 The team is working to find a feasible design that can eliminate these contaminants from the water. The laboratory results have given the team a good idea about what filtration and disinfection processes might work best at the school. In dry season, the school finds themselves with water shortages. The team will design additional collection systems based on the available area at the school in an attempt to lessen this shortage. The energy and sanitation section of the team is designing a handwashing system, as well as toilets that will work best with the anaerobic digester the school has showed interest in. Ideally, the anaerobic digester has the potential to improve sanitation and provide the school with additional energy. Team 1 and Team 2 assembled to work through designs specific to their locations. After design work, the teams began to prepare a preliminary design presentation. 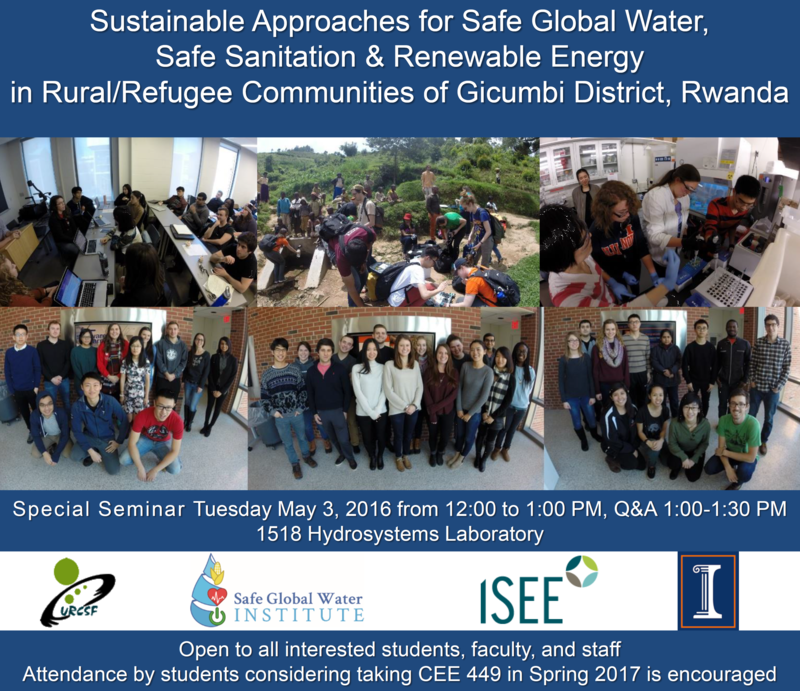 The presentations will take place on Tuesday, April 5th. Each team will present their proposed design. The goal is to allow the other teams to provide feedback on this design and allow for each team to hone and improve their design based on this feedback. Just back from the spring break, the students all seem refresh themselves. The first hour of the class was the presentation of the summary for the lab work on the previous week, as well as the indication of the results for the design in Rwanda. The presentation was made up of three parts: Disinfection lab, Jar Test lab, Clinoptilolite lab. The three teams focused on different sites in Rwanda: Lake Rugezi, Nyamabuye Water Treatment Plant and Muhondo School and analyzing the results from the lab work greatly helped them to evaluate and design solutions for their respective target sites. 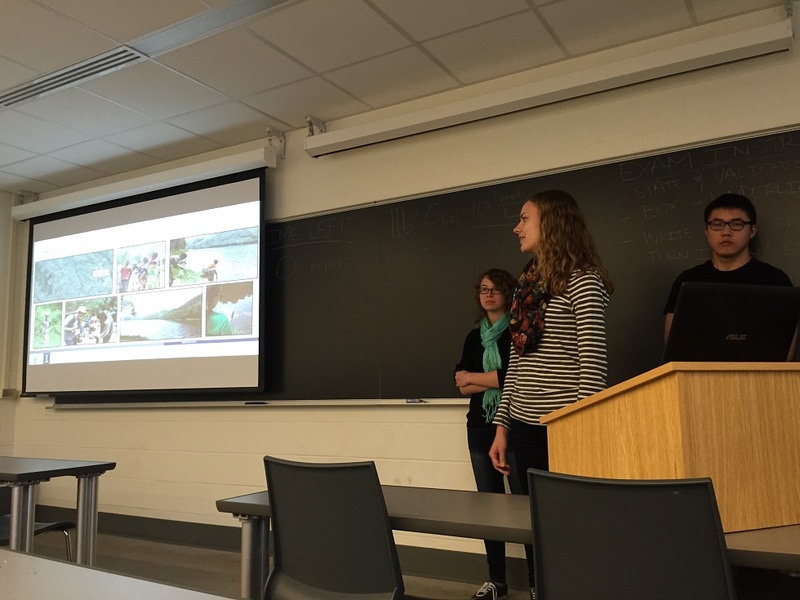 After a short break, the class was divided into three teams to discuss their design projects for Rwanda. The students discussed the main problems of the water treatment plant, Lake Rugezi, and Muhondo School in Rwanda right now, trying to find a better solutions. Today we continue to finish the lab section. 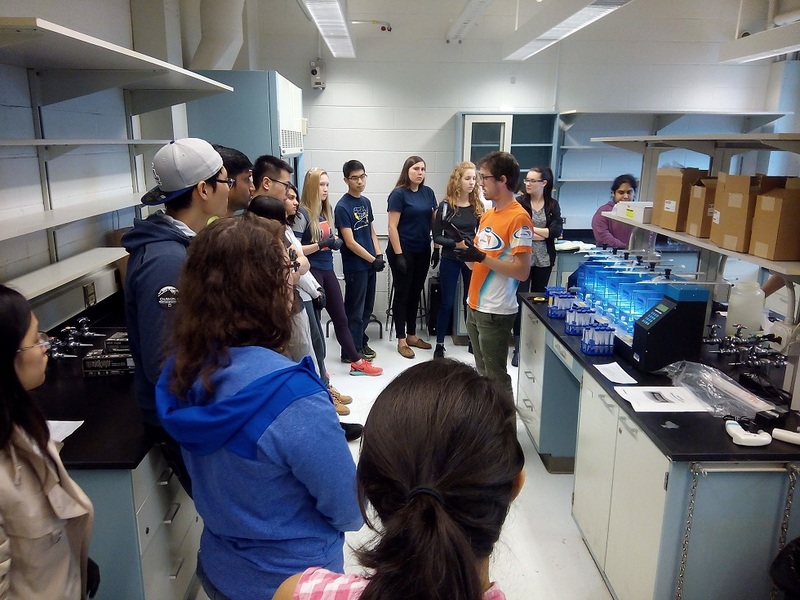 Students were divided into three groups: coagulation, flocculation and sedimentation group, ion exchange group and disinfection group. The coagulation, flocculation and sedimentation group did the jar test with aluminum and moringa seeds on this second day of experiments. Totally three conditions for jar tests were conducted to observe the changes in values of pH, temperature, turbidity and ammonia concentration (mg/L). In the first jar test condition, several doses of alum were used to coagulate water collected in the field with a buffer solution. Sodium bicarbonate (NaHCO3) was used to control the values of pH of the sample water collected in the field. In the second jar test condition, several doses of alum were used without a buffer solution. In the third jar test condition, several doses of crushed moringa seeds were used to coagulate water. 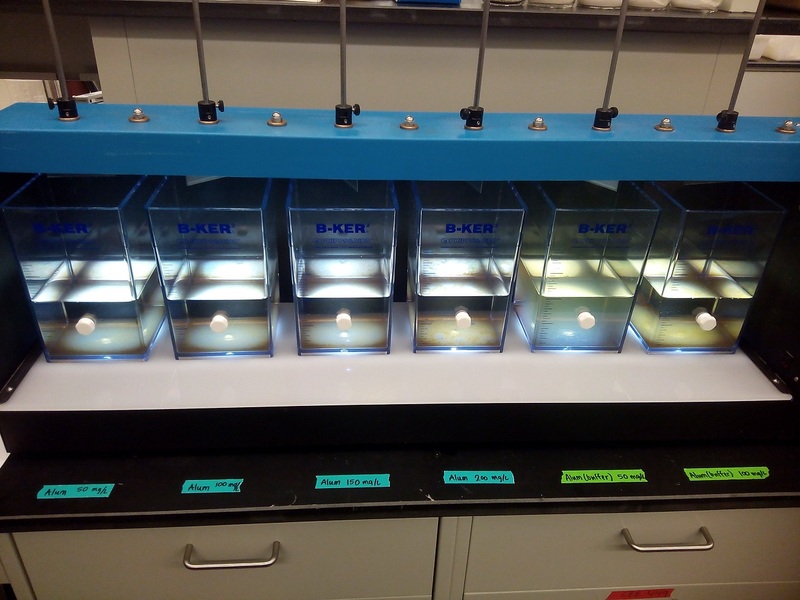 For the data recorded, there are four parameters of interest: pH, temperature, turbidity and ammonia concentration. There are four groups of data collected from the lab. The first one is control tests data, which recorded the initial and final data of buffered and non-buffered solution. The second one is alum in non-buffered solution which includes four jars’ data sets. The third one is alum in buffered solution. The last one is data for moringa seeds. The experiments consolidate the understanding of the procedure of coagulation using aluminum. Detailed discussion and analysis of the results will be included in our lab reports. The information derived from these experiments will be integrated into our final recommendations for the target locations in Rwanda. Today was the first lab rotation for this semester. 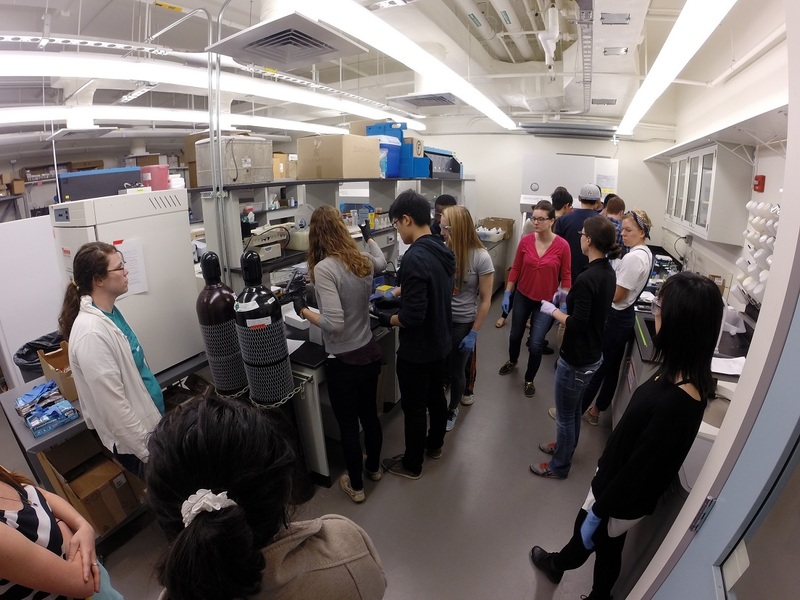 The students were separated into two groups: ion exchange and disinfection. 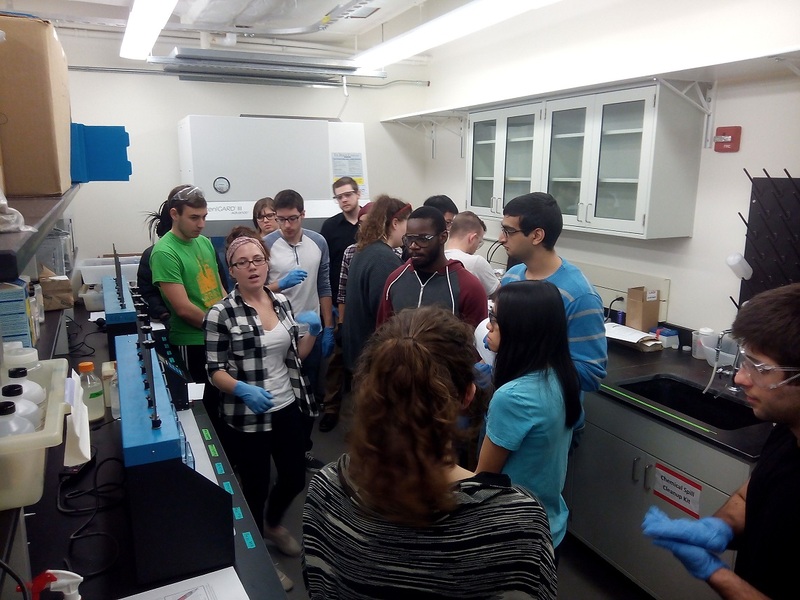 The ion exchange group did a batch reactor test and a column test for ammonia removal. 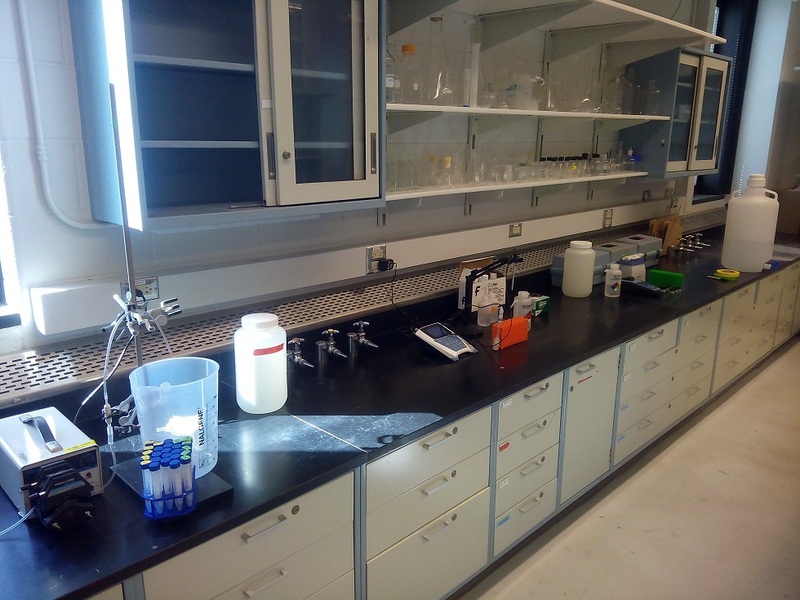 Influent water used in this lab was synthetically made with ammonia to mimic the source water in Rwanda. 19 students participated in this experiment and formed sub groups for different tasks. Water samples were taken at designated times from the batch reactor and the column respectively. 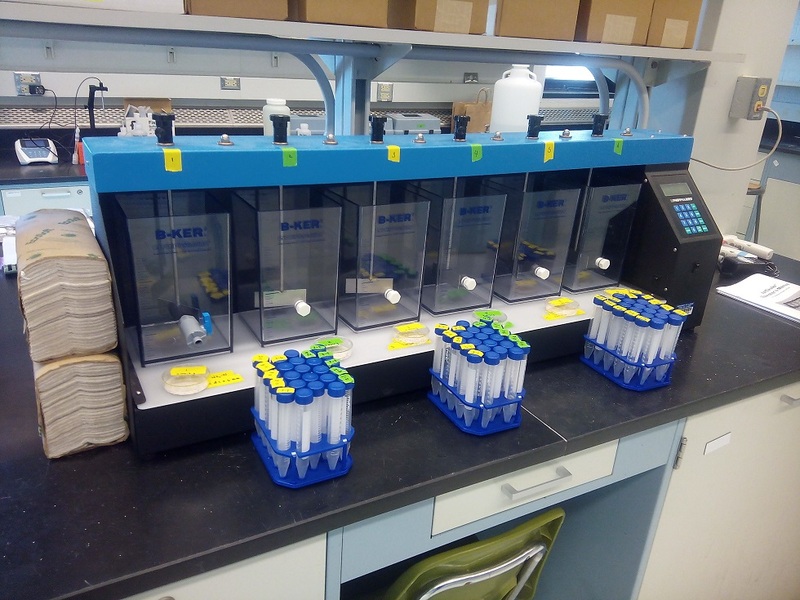 Samples were then processed in the following order by each subgroup: pH measurement, turbidity measurement, filtration, and dilution. The final step was to measure the ammonia concentration of treated water using a colorimeter. 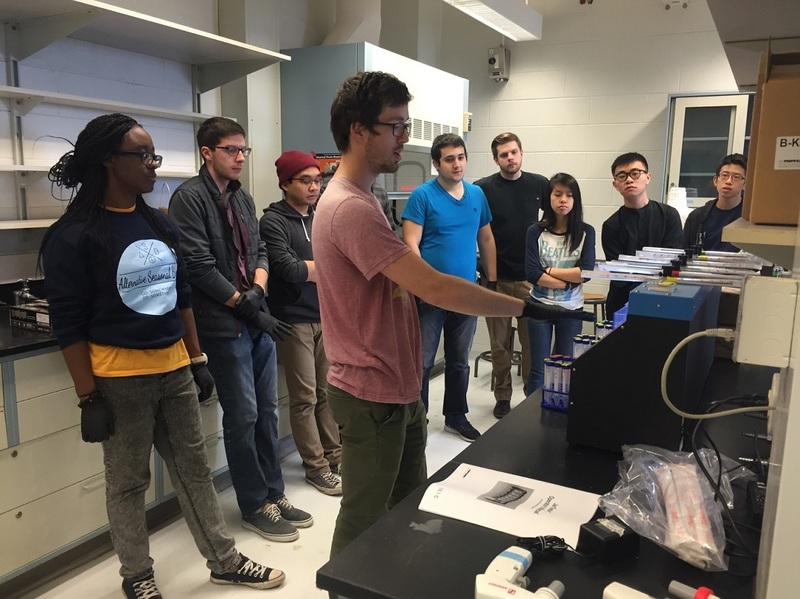 Students and TAs in the ion exchange team also brought music to the lab and created a great working environment. The disinfection team focused on virus inactivation by chlorination. PRD1 bacteriophage was mixed with the synthetic water. Then chlorine was added to the reactor to inactivate the bacteriophage. 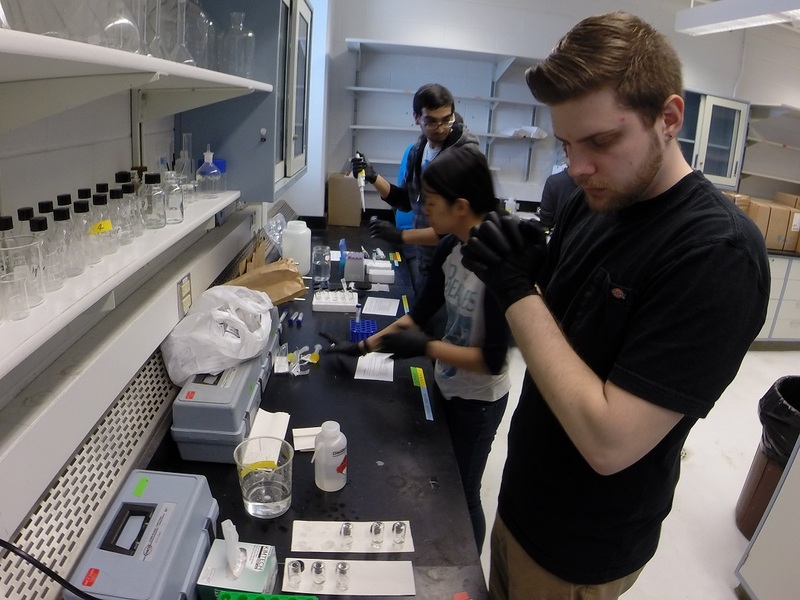 Students took two sets of samples of the chlorine treated water at specific times: one for testing the PRD1 concentration and the other for testing chlorine decay over time. 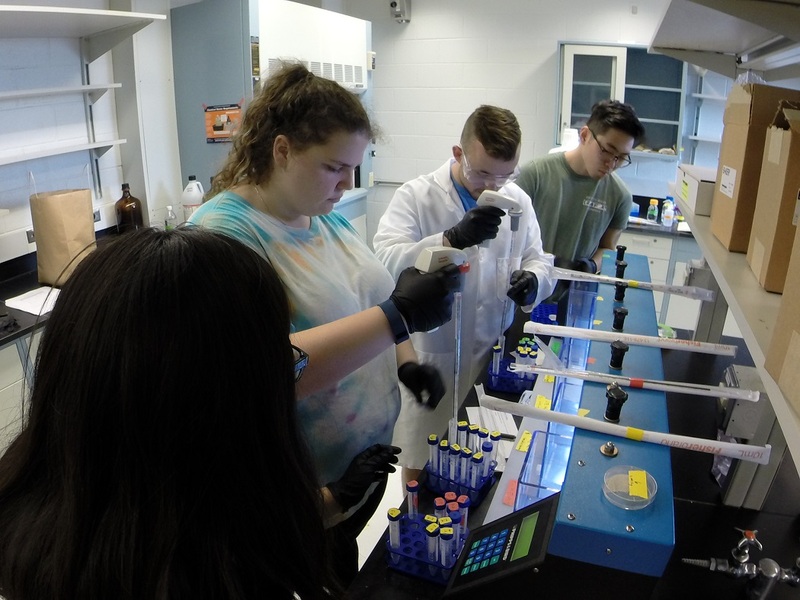 Students plated the treated water samples using agar overlay on petri-dishes to estimate the PRD1 bacteriophage concentration in the treated water. This was a very fun lab. Students were able to have hands on experience of conducting experiments to test water quality. 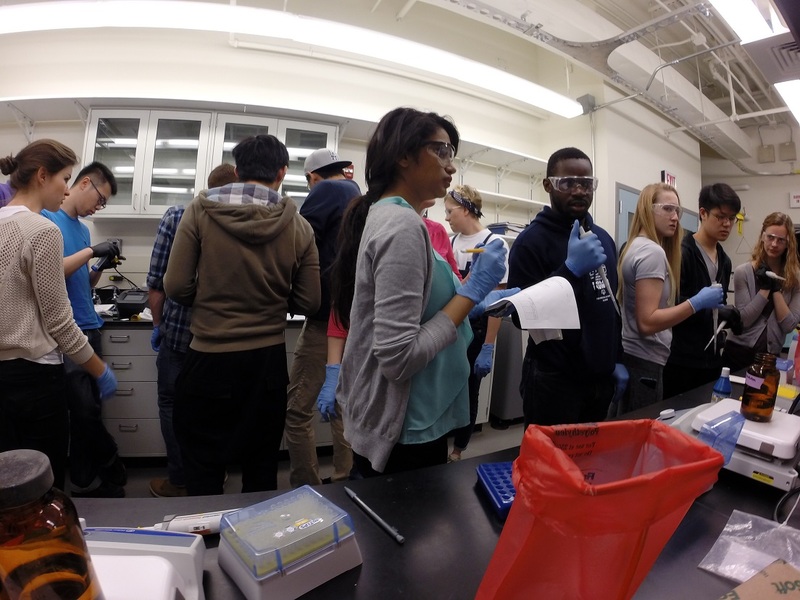 Doing lab experiments is a great way to help the students visualize and understand the knowledge they learn in class. Looking forward to the next lab rotation. 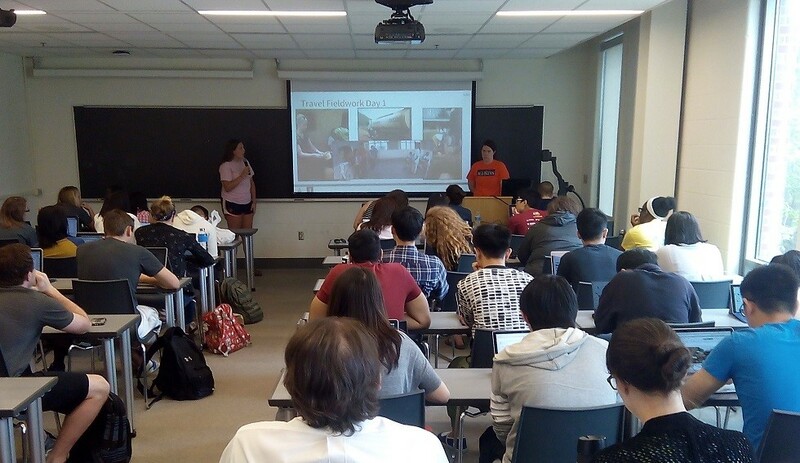 The travel team went over their presentation about the trip to Rwanda. They showed the overview about their whole journey including where they went using Google Earth and the GPS points and tracks recorded during the assessment trip. The team talked about six different sites that were visited including Yaramba Collection Point, GS Muhonda School, a Health Clinic, Gihembe Adjacent Community, a water treatment plant, and a spring box next to the Urugezi Lake. They also explained the sanitation, energy and food security challenges at the communities that they were able to observe in Rwanda. In the end, they talked about their cultural experience in the local market, a safari in Akagera national park, and their visit to the Kigali Genocide Memorial. Today the students in all three teams were working on their technical reports for the first hour of the class. Since Professor Mariñas is back in town, each team had the opportunity to discuss with him about their group project. 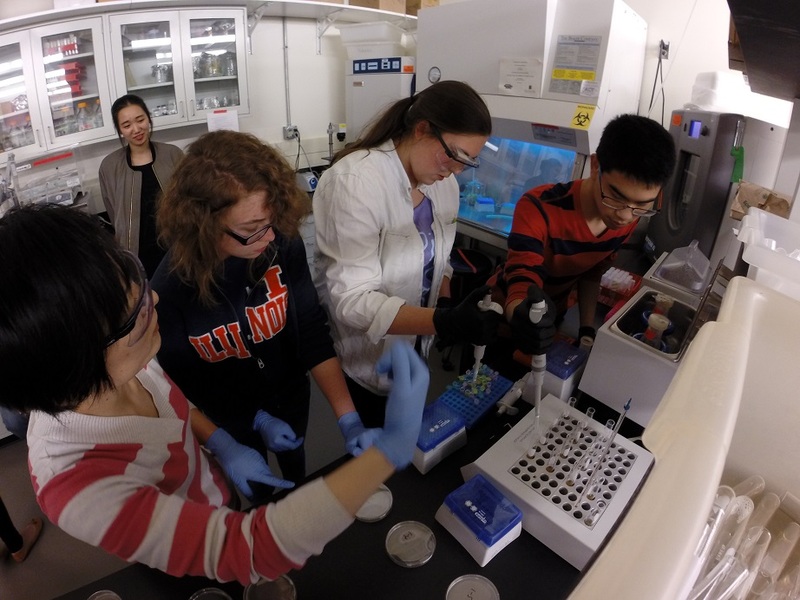 For the last 30 minutes of today’s class, a pre-lab lecture of next week’s lab work about disinfection, jar test, and ammonia removal was given by Daniel, Gabi, and Aimee. 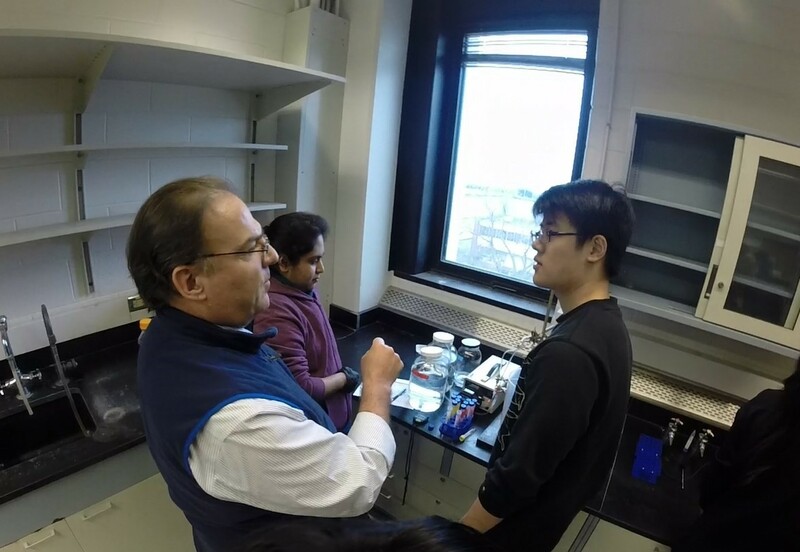 They have gone through the key points of the experiments, the rules in the lab, post-lab worksheets and lab report.